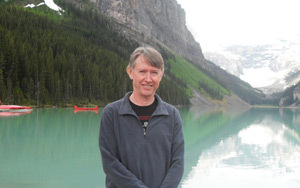 Pannell Discussions » 64 – Compliance with Kyoto » Ideas in economics, environment, policy and more. Among those countries that originally agreed to the Kyoto Protocol, what percentage of the agreed target reductions in greenhouse gas emissions has been met by now? The answer may surprise you. Under the Kyoto Protocol, a large group of countries, collectively referred to as the Annex-1 countries, set targets to reduce their national greenhouse gas emissions relative to their estimated 1990 levels. The range of targets ranged from an 8 percent decrease (for most countries) to a 10 percent increase (for Iceland). Overall, the target aggregate reduction in greenhouse gas emissions agreed to by Annex-1 countries is 5.2%. Nicholas Schneider and Glenn Fox of the University of Guelph asked, and answered, a very interesting question about all this: What percentage of the overall target has been met by now? Have a guess at the answer yourself. Write down your guess, before reading the rest of this article. Schneider and Fox obtained the latest published data on greenhouse gas emissions from the United Nations Framework Convention on Climate Change web site (from 2002) and did the sums. Here is some of what they found. The worst performing countries are Spain, Portugal, Ireland, and Canada, which have each increased emissions by several times their target decrease. For example, Spain and Portugal both had targets of an 8% decrease, but both have increased emissions by about 40%. Australia and the US have not ratified the Protocol (along with Monaco, Croatia and Belarus), but we’ll include their results anyway. Australia’s target was an 8% increase, but we haven’t even met that generous mark. In fact we have had a 22% increase. The US missed their target by even more: target -7%, achieved +13%. If you would like to change your guess about the overall result before I reveal the answer, feel free to do so. OK, now you are locked in. 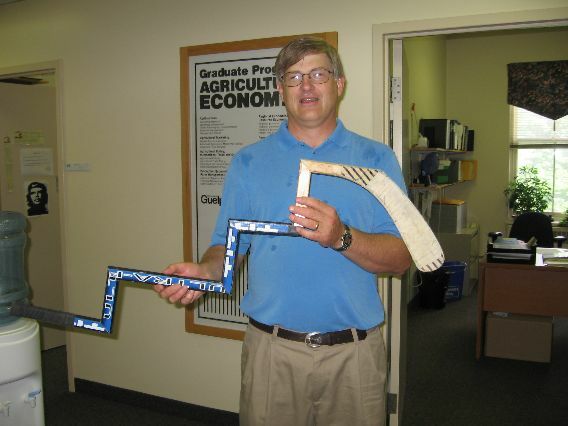 The answer is below this picture of Glenn Fox with his modified version of the famous climate-change hockey stick. “For all of the Annex-1 countries, including those that chose not to ratify the Protocol, … 69 percent of the target reduction in greenhouse gas emissions had been achieved, in aggregate, by 2002” (Schneider and Fox 2005, p.18). To me that seems remarkably high? A major success story! Here is something even more remarkable: for the group of countries that have ratified the Kyoto Protocol (i.e. most of them), the aggregate emission reductions achieved by 2002 were 269% of the target. Clearly, some countries have done a remarkably good job in meeting their targets. Actually a lot have. For countries that have ratified the Protocol, aggregate emission reductions have exceeded the target every year since 1991. That is, it took only one year to meet the target! “Much of the reduction in aggregate greenhouse gas emissions can be attributed to an economic downturn in the former Soviet Bloc countries, with the Russian Federation and Ukraine being the two largest reducers of emissions. By the end of the 1990s, gross domestic product in the Russian Federation had sunk to roughly half of what it had been 10 years earlier. These reductions were not the result of purposeful abatement” (Schneider and Fox 2005, p.18), but incidental emission reductions are still reductions. This raises a really interesting point about the operation of international carbon markets: “if there are 269 credits on the supply side for every 100 credits on the demand side, the prospects for positive prices for credits in a genuinely open market among the Annex-1 countries are not great” (Schneider and Fox 2005, p.19). An open market would achieve nothing, because there would be no pressure for positive prices, which can only come about by a lack of large enough reductions. Climate change advocates might think it is not very relevant because much of the gains relate to economic stagnation in former Soviet Bloc countries, which presumably is temporary. But surely the result is so amazing that it is worth discussing. It might teach us something. And apart from the Soviet Bloc, surely the remarkable progress in some countries of Western Europe is worthy of comment. Less generously, it is not consistent with the climate of fear that some climate change advocates wish to create. It might make climate change alarmists look a bit silly. They’re telling us that the climate is still getting hotter, when we have already abated greenhouse gas emission by most of the target amount. It would be unfair of us to criticise it on that basis, of course, because everyone involved knows that Kyoto is not nearly enough to affect climate in any measurable way. It highlights how inherently unpredictable CO2 levels are and how difficult it will be to control them, whereas the Kyoto advocates would rather create an impression that it is something we can manage (otherwise they couldn’t justify their assertions that we need to take action). In reality, CO2 levels are largely driven by factors that are much larger and more dominant than the effects of small market prices for CO2 credits, which is the only practical mechanism in Kyoto. They actually know that Kyoto is a dud policy, and they would rather not draw attention to the fact because they want to foist even bigger dud policies onto us. Kyoto is a dud, in my view, because, even if one believes the results of the IPCC, this type of policy is incapable of generating the level of greenhouse gas abatement that would be necessary to make a meaningful difference to climate. I think the IPCC’s own modelling results lead one to that conclusion, although they would not admit it. In my view, given all the uncertainties and the low probability of success, if we want to do something to try to moderate climate change, it should be low cost, and have good potential for high payoff. I reckon there is only one option that meets these criteria: research to develop new renewable energy technologies that are more efficient and cost effective. At the moment we hope carbon-credit schemes might create the incentives for sufficient innovation, but I think it would be much more direct and vastly cheaper to simply fund the innovation development. Nicholas Schneider and Glenn Fox (2005). A win for Kyoto – so where’s the party? Fraser Forum July/August 2005, pp. 18-20. available here. Posted on 8 August, 2005 by David Pannell. This entry was posted in Climate change.